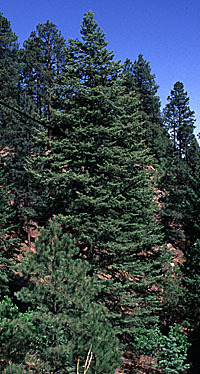 Abies concolor, White Fir, growing at Oso Pass, West Face of the Sandia Mountains, 9,340 feet, May 30, 2003. 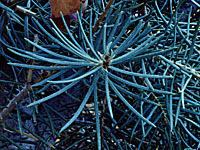 Characteristics include light colored single needles and a habit of growing near streambanks and in canyons. 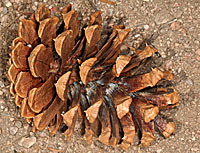 Engelmann Spruce, Picea engelmanni, growing around Summit Lake above Crested Butte, Colorado, 10,400 feet, July 6, 2007.Tree height is 70 to 80 feet. Trunk diameter 45 cm., bark plates, thin, flakey, 5 cm. by 3 cm.. new growth 50 mm. Needles 20 mm. long by 1mm. wide. Smaller trunk diameter is 17 cm. 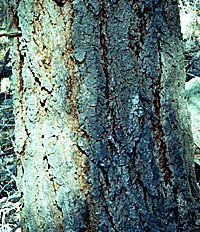 .Bark plates not well developed on younger trees. 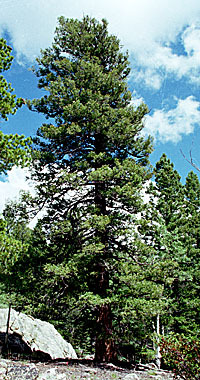 Ponderosa Pine, Pinus ponderosa,growing on a sandy substrate, flats above Taylor Creek, 8,450 Feet, July 6, 2007. Tree height 80 feet, trunk diameter 50 cm, bark flakey plates, very long and 4 to 8 cm. 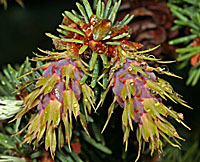 wide, needles in bunches of three, length 125 mm, thickness 1.5 mm, cones male 15 x 6 mm, female 100x 70 mm. 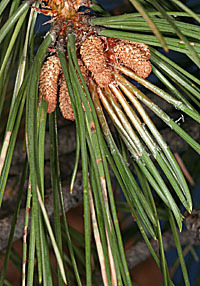 Pines typically have multiple needles. 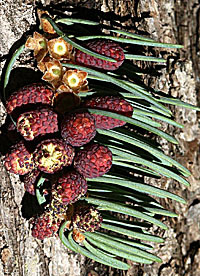 Pseudotsuga mensiesii, Douglas Firs, from magnificent trees across a broad range of the southwest. In moisture requirements and elevation these trees live above the pinyon-juniper zone and below the subalpine zone of Engelmann Spruce. 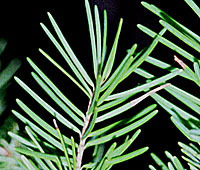 In colorado and New Mexico they occupy a "mixed conifer" zone with Ponderosa Pine and along the streams, Blue Spruce.